I'm setting up a Style School to teach girls how to do makeovers, create fab outfits and even accessorize! It's gonna be sooooo cool. Gotta go and find some top-secret club members! I'm just crossing my fingers that Mr.Cain (aka the school uniform police) doesn't find out - or I'll be in massivo trouble! Byeeeeee! Read the crazy confessions of very-nearly-teenager Lucy Jessica Hartley as tyrannical teachers, feisty friends and fashion fiascos all stand in the way of her style-queen status. I was actually quite surprised by this book. I wasn't really sure if I would like this one or not, but I kept reading it all the way through and...I absolutely loved it! It was a little un-realistic in places, but somehow that made it even more enjoyable. The story was fantastically written and the author got into the mind of a 'very-nearly-teenager' really well. I also like the cover, although I think it makes it look a bit more aimed at younger readers - it's definitely not suitable for them though! The storyline did start to get a little bit predictable at the beginning, but it would be teamed with an unexpected twist. This. Book. Is. Amazing. It has everything a story needs! If you want to read a book filled with fashion, adventure, humour and yes, even cheese sandwiches (See? Told you this book had everything!) then I definitely recommend this book for readers 10+. My rating for the book? 5/5! Great review! 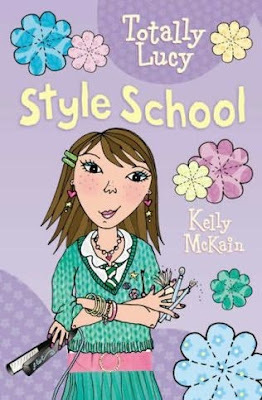 I've never read this series though I've loved other books by Kelly McCain and I think she's a fantastic author. It's great to read all about this. Thanks! It's Kelly here, author of the Totally Lucy books. Thanks so much for your fab reviews - it's great to hear that you enjoyed Lucy so much and really interesting to get your feedback on the characters, annoying abbreviations etc! I'll tell Vici how much you LURVE the artwork - she'll be soooooooo thrilled!